Surface flaws in nonporous material can be detected by the fluorescent penetrant method. Laboratory controlled conditions enable economical production. The job of a fluorescent or visible penetrant is to seep into any imperfections open to the surface. 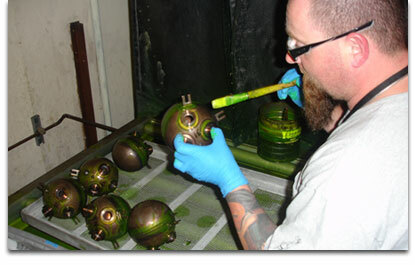 After waiting a sufficient amount of time the penetrant is washed off the surface of the part and then, aided by a blacklight, an inspector looks for any bright green indications.